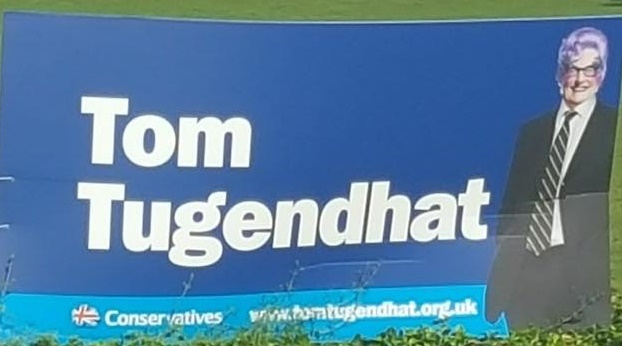 A million words, probably too many words, have already been written about the Conservative campaign, the manifesto, the Party Leader and what went wrong. There is nothing new I can add, so I will not try. My analysis will therefore be confined to the one subject I can speak about with authority and knowledge: the voluntary party and the increasing need for reform. 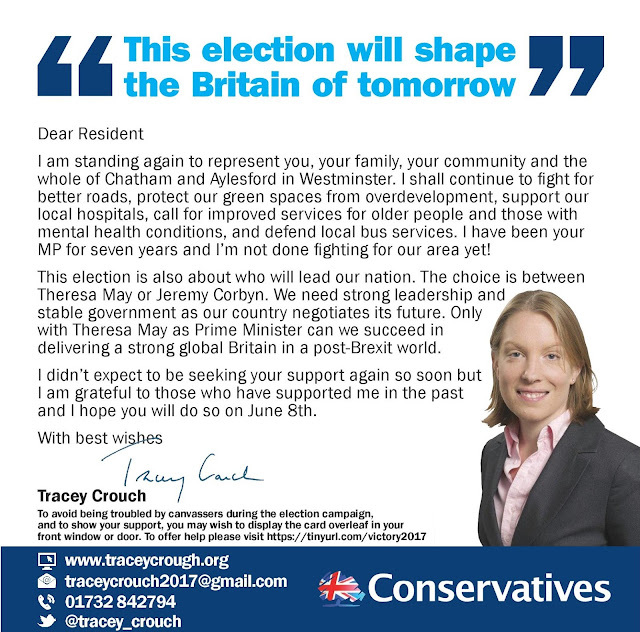 “We must ensure that any changes are bedded-in before our next major electoral challenge. Perhaps the basis for the future should be county-wide Associations or federations, stripping away layers of bureaucracy and introspection. Whatever we do, we should not allow a small number of recalcitrant Associations to use self-interest to block essential reforms which in our hearts we all know must come. How prescient those words were, and how real my fears that we would prevaricate and dither. The consequences of this were plain to see on Thursday 8th June when it has been widely acknowledged that our ground campaign was woefully inadequate. We were no match for Labour and Momentum. Our troops, what few we had, were in the wrong place at the wrong time. A lack of local political experience resulted in candidates signing up to a national print package with barely any local content and which, too often, arrived too late. The news agenda moved faster than the messaging and we were constantly responding to events rather than leading them. 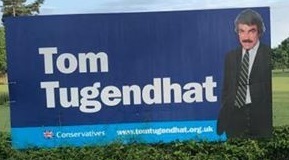 And perhaps, most noticeably of all, without the infrastructure provided by Team 2015, we simply had no way of directing resources to where they were needed most, nor the local knowledge to pick up when target seats had become lost causes – so we carried on campaigning in seats where Labour produced five-figure majorities. Every single one of the above failures could have been avoided if more groupings had been formed in the two years we have been talking about it. Since the West Kent Group was launched I have spoken to hundreds of Associations about the benefits of joint-working; Suffolk, Cheshire, Cambridgeshire, East and West Sussex, Berkshire, Birmingham, and dozens more individual Associations. Every one, without exception, has agreed it is the way forward – but nothing has happened. The good intentions of the progressives are always overcome by the negativity of the backwoodsmen, who will fight to the bitter end over the ownership of the Risograph to stop the change we need happening, whilst all the while our Associations wither and our campaign ability atrophies. We have fiddled while Rome burned around us and the ruins of our procrastination are evidenced by our Parliamentary majority. 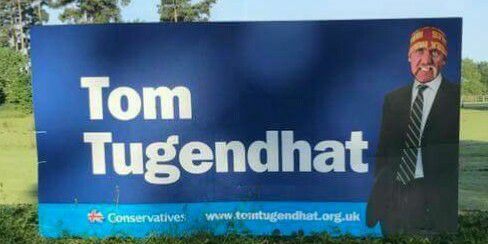 Let there be no doubt that if we had had an effective and focussed ground operation in 2017 the outcome in those 19 seats which we lost by fewer than 1000 votes would almost certainly have been different, and Theresa May would have had her majority. How could nationwide groupings have made a difference? 1. With qualified and professional leadership, each group of candidates could have produced their own local literature, with local content tailored to the priorities and needs of their local communities. 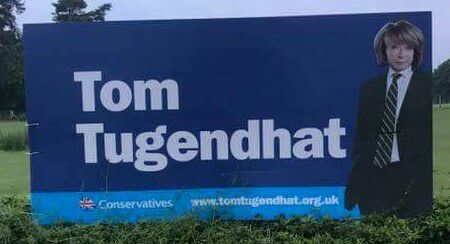 We did this successfully in West Kent, producing, I believe, better quality literature, all of which was delivered on-time, and with within budget. 2. By pooling resources and providing strong and clear leadership we will increase our ability to provide campaign support to target seats exponentially. 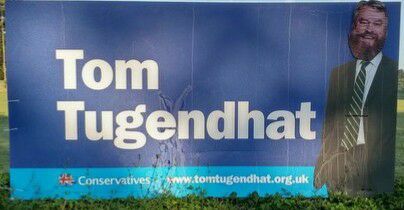 For example, every day of the campaign West Kent provided between 10 and 20 helpers to target seats. 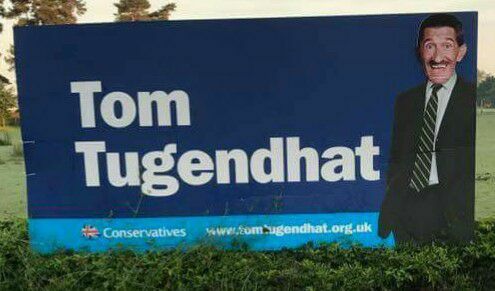 This increased to 30-50 at weekends and, on Tuesday 6th June, over 120 West Kent activists were campaigning in target seats outside Kent. This is the equivalent of two coacheloads. 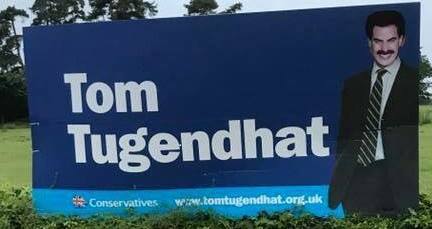 Imagine if that could be replicated 20 times across the country – we would have a peripatetic army of 2,500 campaigners fighting on the doorsteps where they are needed most. All that is needed is vision, organisation and leadership. 3. Perhaps most importantly of all, by selling off buildings which are never occupied, cancelling leases on equipment which is never used and using our combined buying-power to negotiate best value in what we purchase, we will have the resources needed to employ professional staff with the skills to fight elections and build our voluntary party, rather than paying dozens of part-time secretaries, too many of whom just print event tickets and type-up minutes of internal meetings. In light of what happened last week I think we must be much bolder in our approach. MCAs are too little, too late. Putting together 6 failing Associations will not make a successful group. 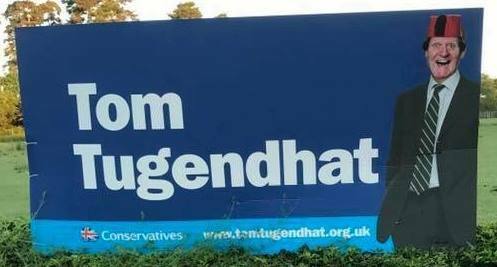 And whilst I have a lot of time and respect for our young generation of Campaign Managers (indeed many have become friends) expecting a 25 year-old to bang heads together and to resist the competing demands of MPs, Council Leaders and “Very Important” activists simply isn’t fair or realistic. A grouping of this nature needs a hardened “grey beard”, unafraid to make unpopular decisions as he or she is sufficiently competent and experienced to do so. So here are my revised proposals to build the voluntary party we need for the next General Election. 1. Groupings of 15-20 constituencies, which will provide the pool of manpower and money necessary to sustain the operation. If this means crossing County boundaries, so be it. 2. The Associations within each group to retain their own autonomy, with their own officers, finances, internal structures and the right to select candidates. 3. A new Group Headquarters in “fit-for-purpose” modern office accommodation, with sufficient technology to run a modern business, and space for the staff. Current freeholds to be sold (with the money to be retained by the original Associatons) and leases terminated on rented properties. 4. Present staff re-employed and re-assigned by the group only if they have the skills needed. 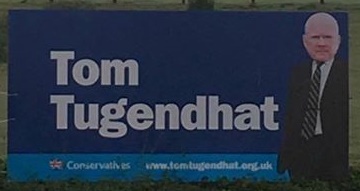 If not, redundancies arranged under the best possible terms. 5. Each group to be headed-up by an experienced County Director, with as many campaign assistants working for him/her as circumstances demand (approximately 2 or 3 per county). Each group to also have an administration manager, a part-time book-keeper, part-time graphic designer and secretarial support as needed. 6. Annual KPI assessments to judge each group’s performance, with a national assessment team to supply additional support and training where needed. 7. Groups to be financed by each member Association pro-rata to their membership and ability. For example. Let us imagine a fictitious group in Barchester County, of 17 constituencies. My proposed structure would give Barchester a County Director, 3 Campaign Assistants, an Admin-Manager, a part-time book-keeper, graphic designer and secretarial support, plus rent on a modern office for around £225,000 pa, or an average of £13,000 per Association. In reality, this would probably mean the financially weaker Associations paying £8,000 pa, and the stronger ones paying £18,000. This is much less than most pay now, for a part-time secretary and an office that seldom functions. For four years now, I have banged on about groupings. Along with others, I contributed to the Feldman Review, and have spent countless evenings and weekends up and down the country evangelising their benefits. My fortnightly columns on Con Home have highlighted best practice. I have met no-one able to make the case for the status quo. 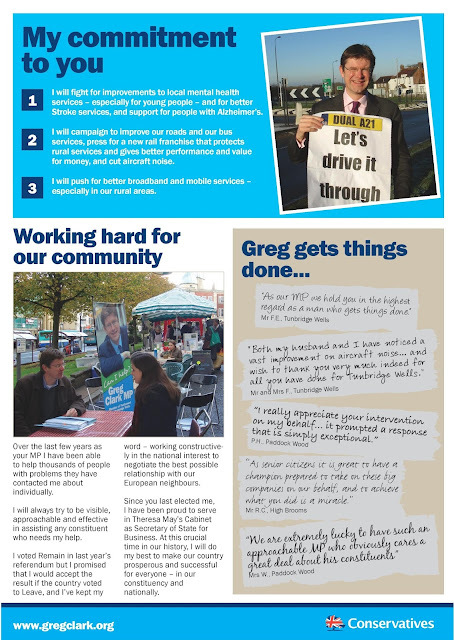 Our inaction, both locally and nationally, contributed greatly to the disappointing results we achieved last Thursday. 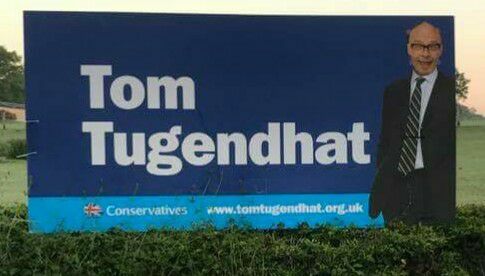 We got away with it (just) in 2017 – unless we take action now, we won’t get away with it again. This is the last article I will write on grouping. 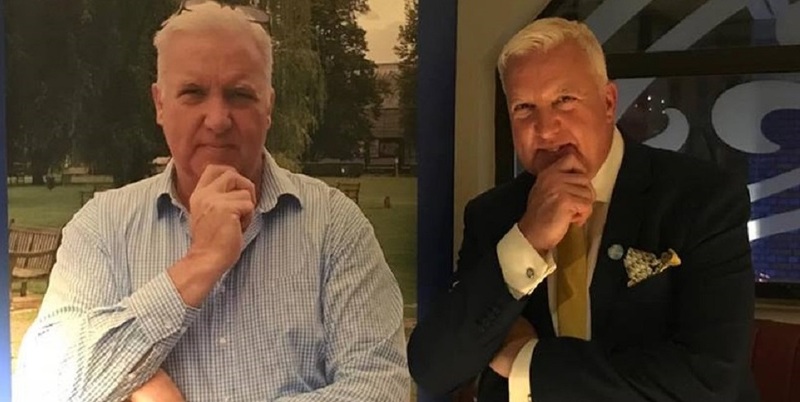 West Kent have shown it can work, and it is now for others (with the authority to bring about change) to have the courage needed to make it happen. A lot of candidates, agents and activists have complimented our West Kent organisation, in particular how fast we were "out of the stalls" and the volume of local literature we produced, the first piece landing on the doormats the day after the County Council campaign finished on Friday 5 May. 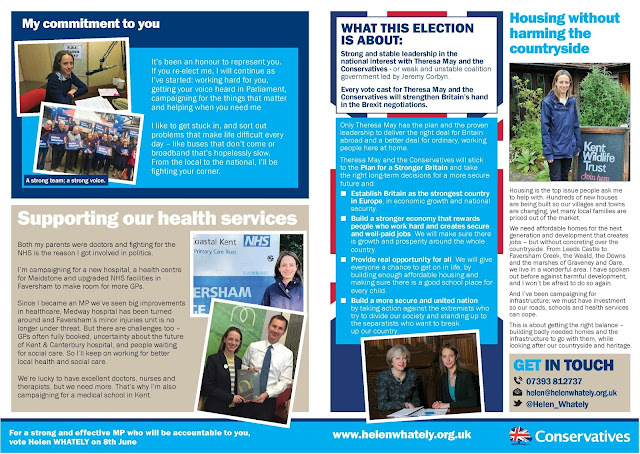 I have written before that other peoples' election leaflets are like baby photographs, only of interest to those whose name they bear, but for the record here is what we have thus far produced. 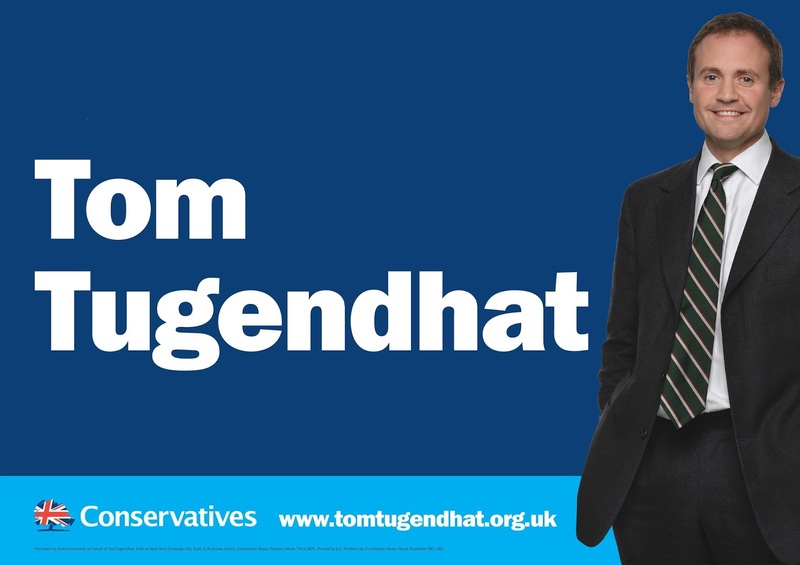 In total, we will be producing 11 separate items of literature for our seven candidates, so between us and our print and design team, by polling day we will have designed , printed and mail merged 77 different leaflets totaling 1.38 million pieces of paper! For the record, here is what we have so far put out. I am only publishing literature which has already landed on the doormats for obvious reasons, but I will add new items as and when they go live. Regardless of which example I use in this blogpost, each of our seven candidates (Greg Clark, Tom Tugendhat, Tracey Crouch, Helen Grant, Adam Holloway, Helen Whately and Craig Mackinlay) have had the same support. 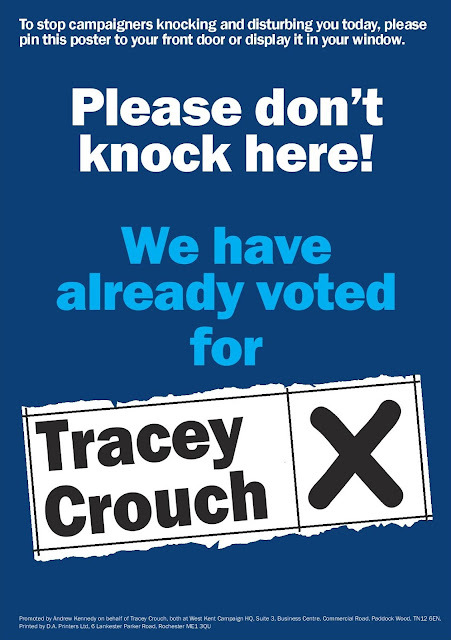 The very final piece of literature produced for our local West Kent candidates was this handy A6 "pledge card", delivered (knock and drop) to known pledges this morning. Lots went into windows during the day, boosting spirits and and showing support. 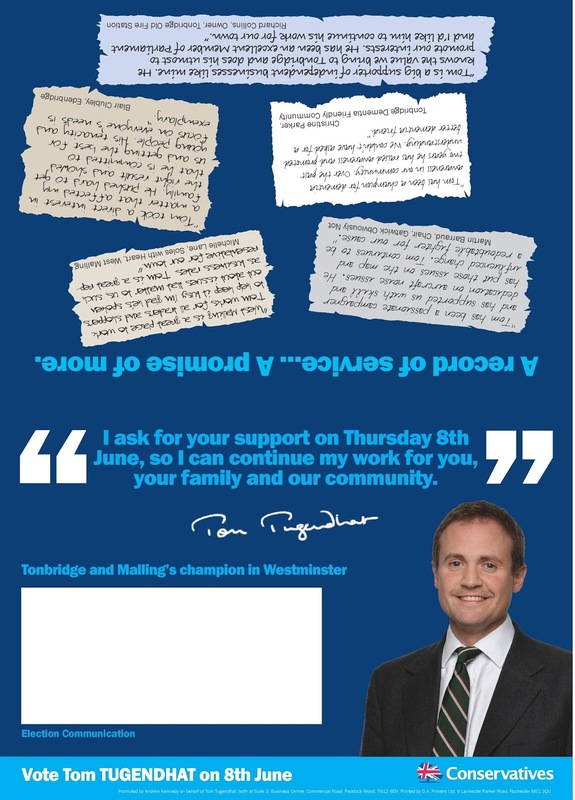 The penultimate piece of West Kent literature landing on the doormats next week are A5 personalised pledge cards. These are going to C P K Q T M voters plus certain targeted MOSAIC groups. These cards are overprinted with the elector's name and address, polling station and roll number. On the reverse is a small window or car poster. 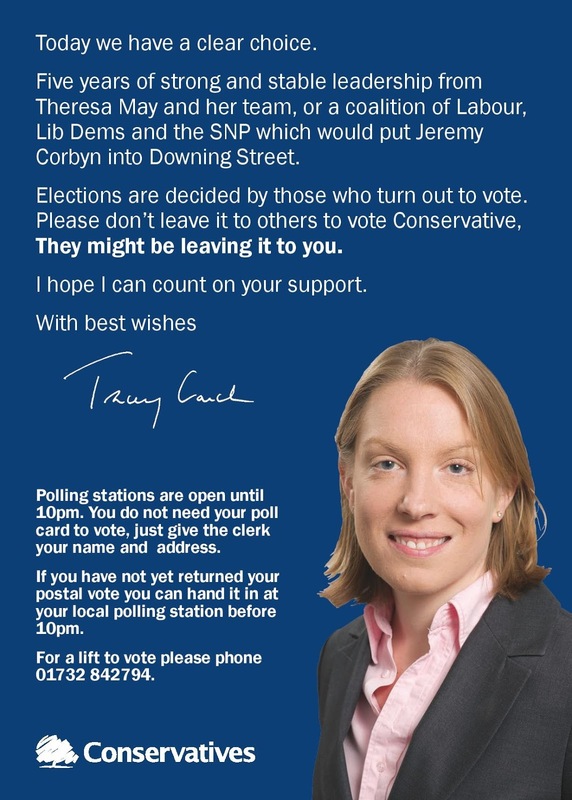 The fourth and final piece of Royal Mail Election Freepost started landing on doormats today. This is EA4 and is being delivered to the second named person in each household, unless the second named person is either 18-25 (in which case the would have received EA2, the younger voters leaflet) or 60+ (in which case they would have received EA3). In these cases, EA4 would have been sent to the 3rd or 4th named person instead. Approximately 20,000 voters per constituency will receive EA4. This leaflet is A4 folded to A5 but landscape rather than portrait. 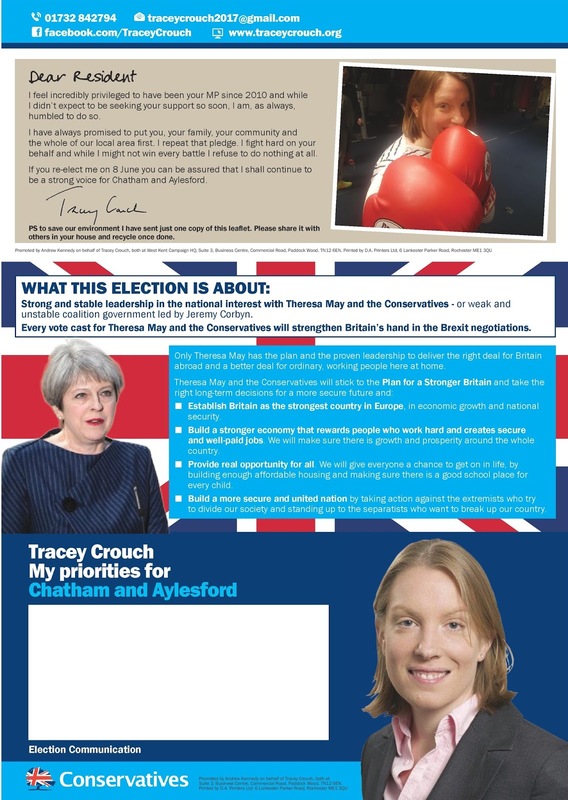 Followers of this running blog may have noticed that all four pieces of Royal Mail Election Post are very deliberately a different shape, size and design. The reason for this being we did not want any voter thinking we had delivered the same leaflet twice. As with all West Kent literature, the content is 100% local (provided by the candidate), the leaflet was designed by me, printed and mail merged locally in Kent using our local print partners. EA2 and EA3 started landing on doormats across the seven constituencies where I am Agent this morning (Sat 20th May). It was planned for these to go out together as they are targeted at very different audiences. 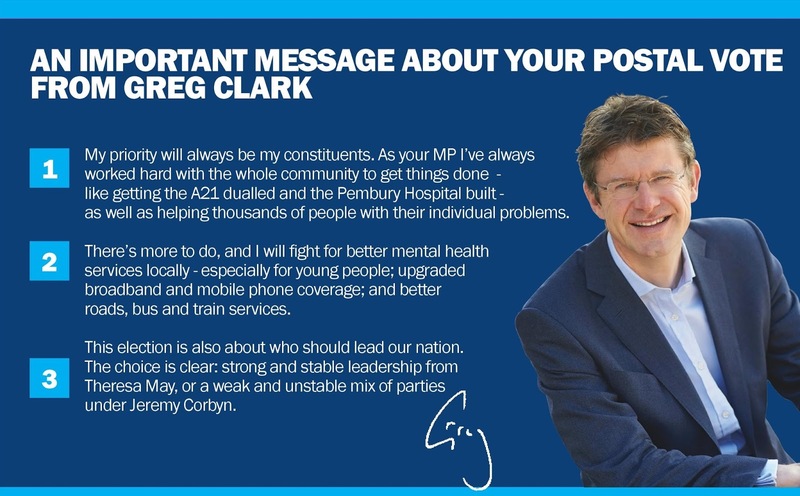 EA2 is 4pp 148mm square: this was sent to approximately 8,000 younger voters (18 - 25yo) in each constituency. 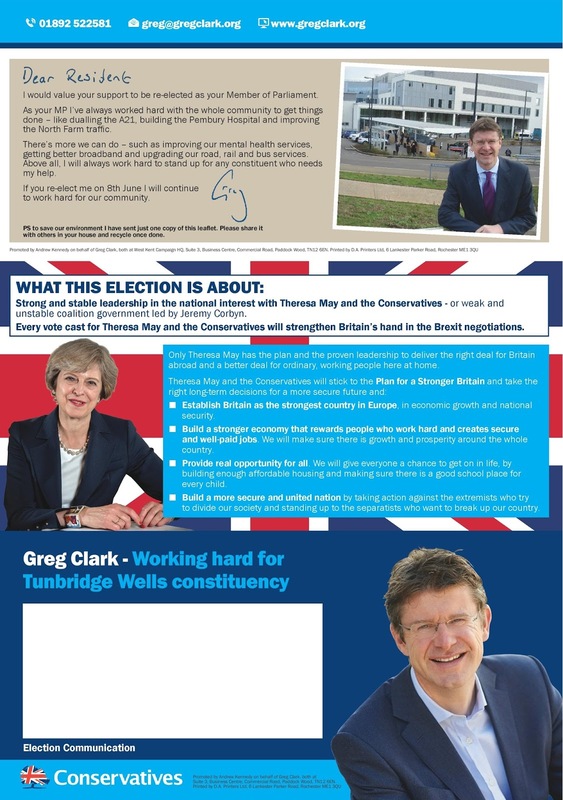 The sample below is Greg Clark's but all seven candidates in the "group" had their own version with 100% locally produced copy. 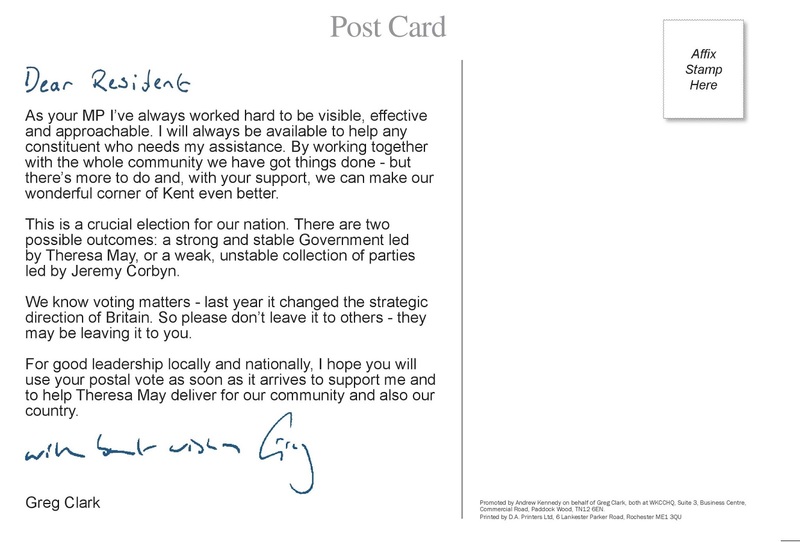 EA3 is A4 folded to A5: this has been sent to voters aged 60 and above (excluding those who received EA1 as "first in household"). EA3 has been sent to around 12,000 voters in each constituency. For those curious how who identified this data, we have developed our own macro which not only splits each household into "first on register" "second on register" and so on, but then re-runs the data and again separates into different tabs those voters we wish to target based on date of birth range. 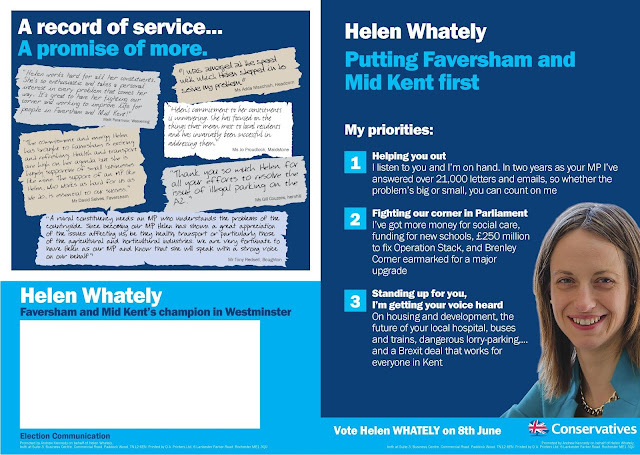 This is Helen Whately's EA3, but once again the leaflet was available to all local candidates with 100% local content. 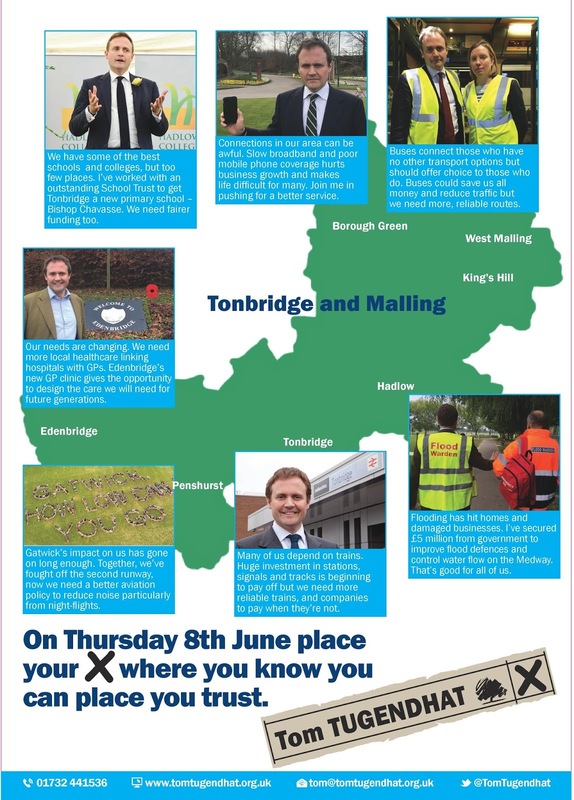 Get Out The Postal Vote Card (GOTPV) with postal votes landing on doormats in just three days time, our teams are now focused on delivering a personal GOTPV postcard to over 70,000 postal voters in West Kent. This is Greg Clak's example. 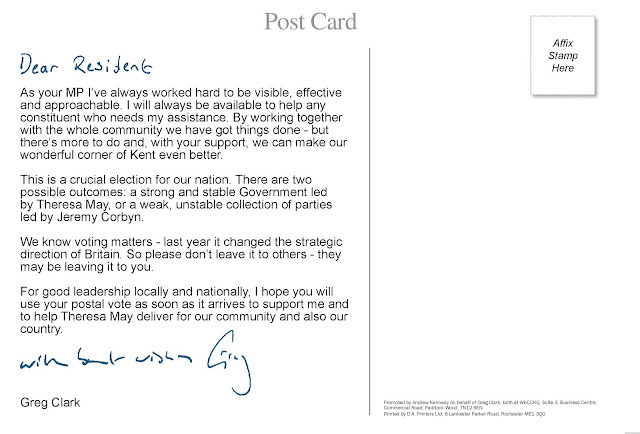 Election Address 1 (EA1) which started landing on the doormats via Royal Mail Election Sort today. This went to the first named elector in every property. Like all West Kent literature, it was designed by me and our graphic designer, Caroline Spenceley, printed by DA Printers in Rochester. The "finishing" (ie, mail merging, folding and packing to Royal Mail requirements) was done by another local business TMB Mailing in Plaxtol. It is A4 folded to DL. First 72 Hour Leaflet (F72): as soon as the Kent County Council campaign finished on Thursday 4 May, our teams transferred smoothly to the Parliamentary campaign, hand-delivering 20,000 - 30,000 F72 leaflets between Friday 5 May and Sunday 7 May. 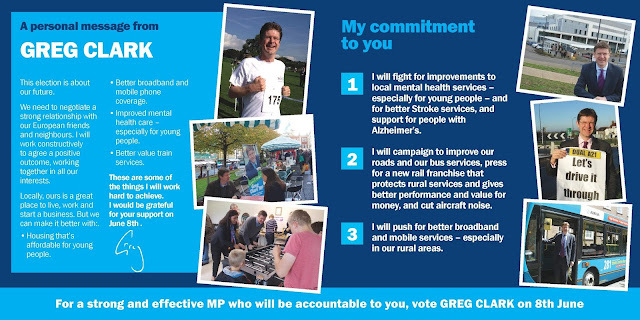 Most Associations had teams at the local railway stations at 6.30am on Friday 5th to meet and greet commuters along with street stalls in all the major town and village centres on Saturday 6th May. 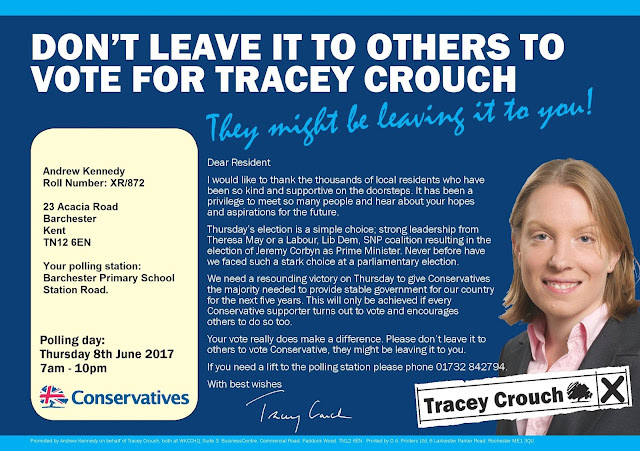 Calling Card: We deliberately don't use the traditional "sorry you were out when we called" wording as I like candidates and their teams to hand these out "far and wide" when canvassing, something harder to do if they say "sorry you were out." These cards can also be used to hand-out at street stalls and railway stations if stocks of other generic leaflets run low. Letterhead: In previous elections we had supplies of letterheads printed, which either ran out necessitating a reprint, or there were boxes left after the event. This year, having now bought a high quality full colour printer, I simply asked our designer for a high-res pdf from which we print letterheads as needed. 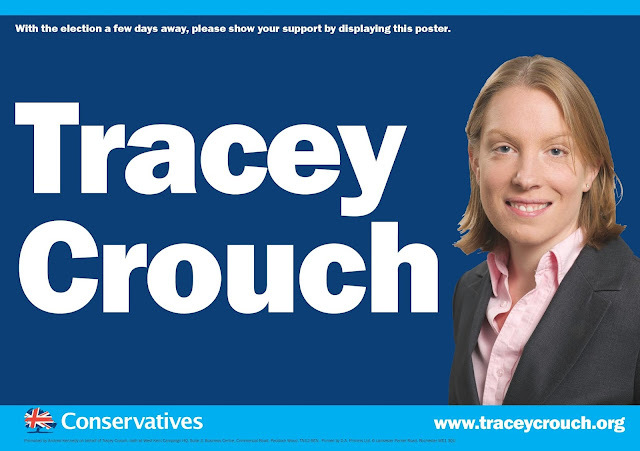 Window posters and correx boards: again, I have our posters and boards produced locally. 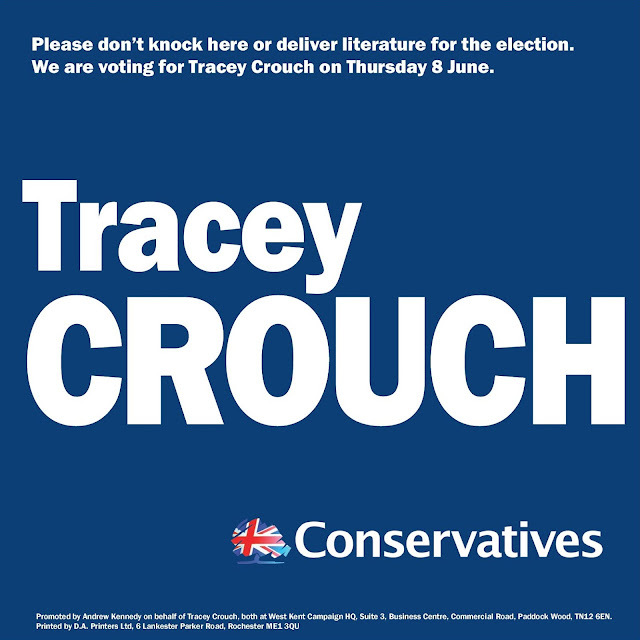 DA printers do our A3 and A4 window posters and our correx boards are done to exactly the same design by another local company, Scarbutts Ltd in West Malling. 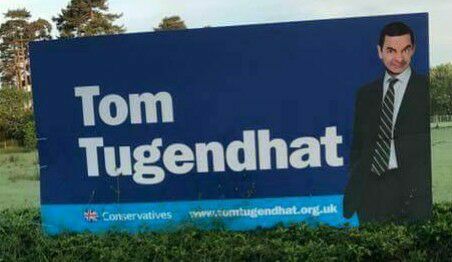 The ever changing face of Tom Tugendhat! In mid May I received a call from a loyal member of Tom Tugendhat's campaign team. 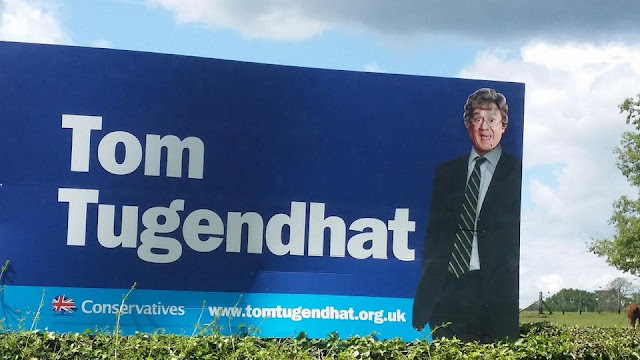 Huffing and puffing with indignation, he informed me "some local oik has defaced Tom's poster on Castle Way" (a busy main road which connects many of Kent's wealthy suburbs to the M20). Thinking it has been spray painted with offensive graffiti, I asked what had happened. "Someone has pasted a photograph of a Mr Bean over Tom's face." Much to our team members surprise, rather than being outraged, I burst out laughing. I thought it was amusing and light-hearted, and at a time when Conservative posters are being obliterated by crude and thoughtless obscenities, it was actually an enjoyable piece of political satire. Each day since the (still unknown) culprit has replaced the face. We have had Dame Edna, Brian Blessed, Gail Potter, Tom Sellick, Tommy Cooper and many more. Not a single day has been missed. It is done either very late at night or at dawn, as each morning there is a new face to greet the thousands of drivers who pass this spot each day. The trouble the "artist" goes to is considerable. The face is a high quality colour print out, in perfect proportion to the body and cut out and attached with great care. 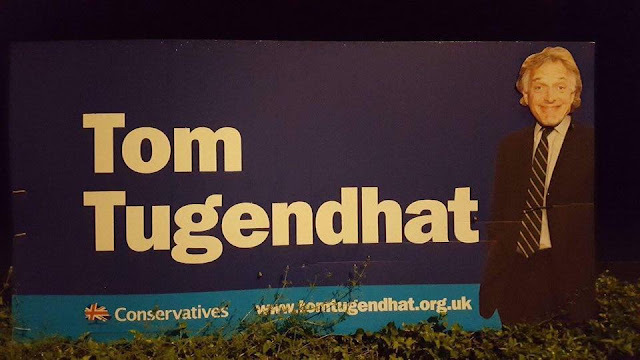 The ever changing poster has now taken on a life of its own. The local Parish Council Facebook page posts a new photograph each day. 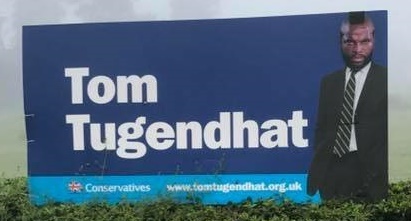 Drivers can be seen pulling into the lay-by to take photographs and the poster has been featured on BBC Radio Kent and in both local newspapers. One lady was quoted "I have changed my route to work as seeing who it is each day it brightens up my morning." 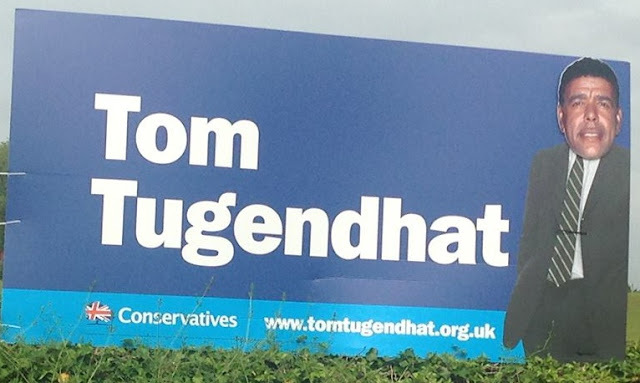 Such is the goodwill generated that Huw Merriman (Bexhill and Battle MP/Candidate) suggested that I was doing it to gain publicity, and said he wished his local vandals were as creative as ours. I can assure readers that it is not me, I only wish I was so artistic. Although I genuinely do not know who is doing this, I know the area well and I know most of the local "movers and shakers" in the parish. I have sent a message to ask for a very special face for tomorrow to cheer us up on the eve of poll. I await with eager anticipation to see if my request is granted. For posterity, here are all the posters from day one onward. 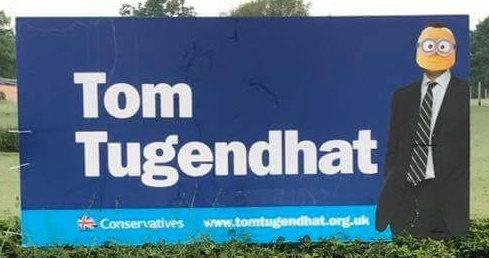 To whoever has been doing this, well done and thank you for cheering up what has been a somewhat long and difficult election campaign.